7pm Mass of the Lord’s Supper. This is a 2-hour Eucharistic Liturgy, which starts outside and includes Lighting of New Fire, the Blessing of the Paschal Candle, Blessing of Holy Water & the Baptism / Reception of Candidates, Confirmation & First Eucharist for those being received into the Church. Palms are Sacramentals – blessed objects that are sacred signs to remind us that Christ is always with us. Old palms should be burned or buried. There will be a basket in the church Narthex to collect old palms until Holy Thursday. Divine Mercy Sunday Prayer Service, April 28, 1:30pm, following the 12:15pm Mass. We invite all families to join in this day of extraordinary grace and promise! On this day, Jesus told St. Faustina, “The soul that will go to Confession and receive Holy Communion shall obtain complete forgiveness of sins and punishment” (Diary 699). During this special prayer service at All Saints, let us especially remember our loved ones who have strayed from the Church, that the Lord will touch their hearts to return to the Church and deepen their fervor so that All may be One! Prepare to receive the extraordinary graces of Divine Mercy Sunday by praying the DIVINE MERCY NOVENA! Jesus asked that Divine Mercy Sunday, the Sunday after Easter, be preceded by a Novena of Chaplets beginning on Good Friday. 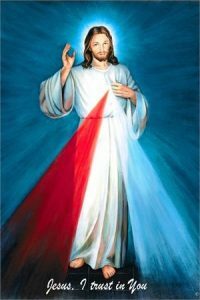 The Chaplet should be offered each day for the days intention specified by Jesus (see brochures in Church vestibule or go to www.the divinemercy.org). The Novena can be prayed individually or in community. All Saints will be praying the Divine Mercy Novena daily, beginning on Good Friday, at the times and locations listed below. Please join in this powerful time of prayer! Jesus promised, “By this novena (of chaplets), I will grant every possible grace to souls” (Diary, 796).